Many applications of displays involve installation in environments having a high humidity level. Of specific importance in this regard is the marine environment. In this application, an LCD, OLED or Plasma monitor, no matter how well sealed, will eventually “inhale” moisture within the enclosure. Once inside the enclosure, it is extremely difficult to remove the water vapor. As a result, the protective clear window installed in front of the display will develop a fogged appearance when it becomes chilled. Ways in which it can become chilled include direct impingement of air conditioned air onto the face of the display or spray impacting the outside. The fog which develops inside of the window is frequently difficult to remove without heating the glass or opening the display. General Digital Optical Bonding Laboratories has developed two distinctly different ways to prevent this from being an issue. The first technique is to optically bond the window to the flat panel display. This eliminates the air space between the display and the window, thereby eliminating moisture entirely from the space, and hence, the problem of condensation. The second technique is to provide a hermetically-sealed window which includes a desiccating gasket as a part of the seal. This window is, in effect, a custom thermo-pane window tailored to the display. The following paragraphs will describe in more detail the trade-offs in this design. Comparing the mechanical design of the sealed window to other designs, we find that this approach adds depth to the display. The thinnest design we would recommend is 7/16". This is composed of two pieces of 3 mm glass, spaced apart by the thinnest desiccant gasket available (3/16"). In addition, there will need to be a small air gap between the inner layer of the window and the LCD, OLED or Plasma display. Compared with a 3 mm protective window, we need an additional 5/16" inch in the display depth. Optical bonding does not add this extra space. This situation can be substantially improved by the use of antireflection (AR) coatings on the glass. All of the surfaces used in the insulated protective window may be so coated. This will add to the cost of the display, but the reflection losses can be reduced from approximately 4% per surface (7-8% per glass plate) to less than 0.5% per surface (1% per glass plate). Furthermore, the display face reflection can be reduced through the use of AR-coated plastic films laminated directly to the display. Using these, it is possible to increase the effective light transmission capability of the display monitor from 85% (two glass plates without coatings) to 98+% (all four surfaces AR coated). This improvement can be utilized by the designer to either increase the display luminance at fixed input power, or to reduce the input power at a fixed luminance. General Digital Optical Bonding Laboratories has successfully demonstrated the advantages of this design approach and has supplied displays using this window to the new class of attack submarines being manufactured by Electric Boat Company. 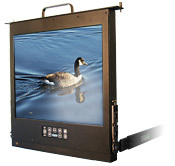 We are well prepared to provide monitors or desiccated windows for use by OEM display manufacturers. Please contact us for a quote on your application.